Then find out how to score free Cronuts and Cookie Shots today. 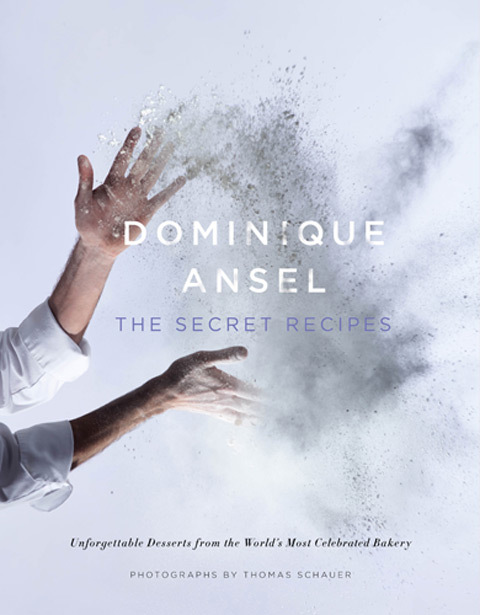 Today, Simon & Schuster revealed the cover of pastry chef Dominique Ansel’s upcoming cookbook, Dominique Ansel: The Secret Recipes. Ansel is the man behind the Cronut and other magical pastries, and the book—which comes out October 28—will feature a recipe for making a Cronut at home, as well as instructions on how to make other DA favorites (we’re hoping that includes recipes for kouign amanns, madeleines, and the Paris-NY). The whimsical cover was shot by photographer Thomas Schauer, who also did the photography for Daniel Boulud’s cookbook, Daniel: My French Cuisine. To celebrate the reveal of Chef Dominique Ansel’s new book cover, the DA team will be giving out limited quantities of the Cronut™ and Cookie Shot for free at select locations throughout Manhattan. To cop some free pastries, follow @dominiqueansel on Twitter or Instagram for updates (starting at 10:30am) revealing where the pastries will be given out throughout the day, from 11:00am to 5:30pm. UPDATE: The first location where the DA team will be giving out free pastries is: Fifth Ave between 21st and 22nd street at 11am. The book is currently available for pre-order on dominiqueanselbook.com.